My kitchen’s been overwhelmed with pear processing. It’s a good problem to have, even if I have been putting the tomatoes off for way too long. This year, I finally discovered my favorite ways to put pears up. Check out Part 1 of this Pear Bounty to get all that caramelized pear goodness. Butter, brandy and honey never tasted so good as they do on these pears! Of course, I can’t have a lot of fruit without making a pie. 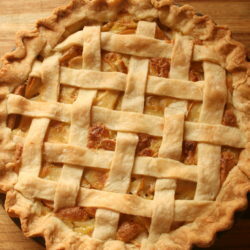 Mmmm Moraga Pear Pie! You can find the recipe at the end of this post, which your welcome to skip to, but keep reading if you want to learn the easiest of all ways to save pears. Harvesting pears is tricky business without a pear picker. Another item to add to that gardener’s gift list! Thankfully, we were able to pick all these by hand with just a ladder. 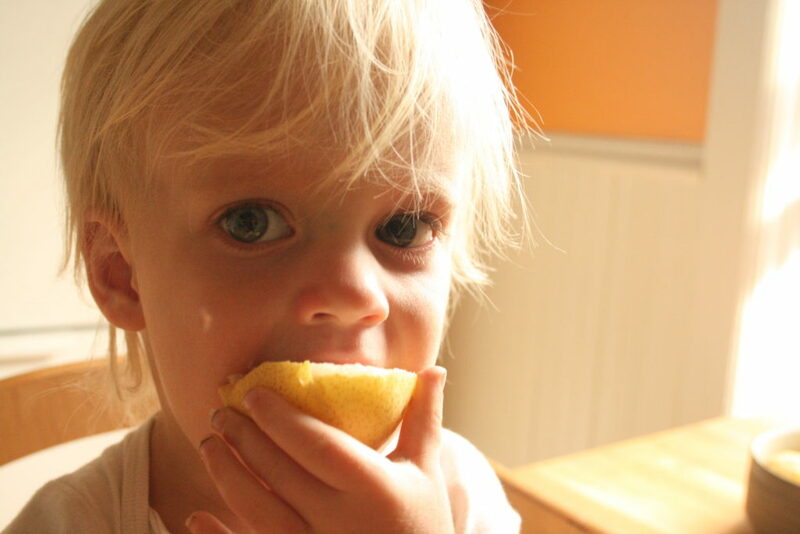 I recently learned (the hard way) that you are supposed to pick pears when they are unripe. Not very intuitive, but they do better this way. When left on the tree to ripen, the inside of the pear turns overripe. Instead, pull them when they’re green, and they’ll quickly ripen to juicy perfection all the way through. My friend’s tree is much bigger, which means more pears, but without a picker, it’s hard to harvest them with tenderness. Most of them took a long fall to the hard ground, thereby getting some cracks which hastens spoilage. 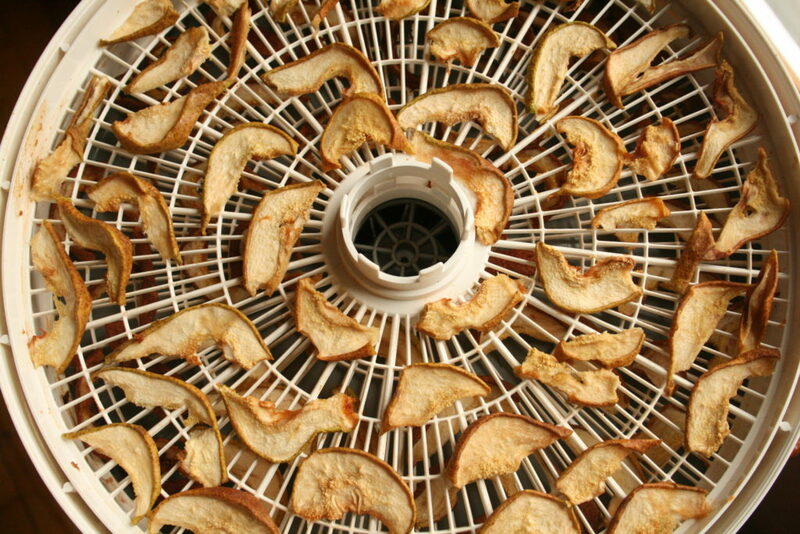 In an effort to not let these broken ones continue to go bad, I sliced them thin and reached for my dehydrator. My dehydrator is a reliable pal that always saves the day when I’m in a pinch with mounds of produce. Only, this time the motor didn’t work! With pears already sliced, my generous neighbor saved the day (I really am going to return your dehydrator, soon, promise!). It’s by this drama that I discovered the deliciousness of dried pears! No peeling, no treatment. Just slice and press a button. Delicious and easy! Pear skins are very thin, so I left them on. I try to leave skins on wherever I can because they hold nutrients and not peeling saves me time. If you think that you’d prefer a more tender pear leather, peel them first. For our part, we don’t mind the skins. That first batch was so tasty, I just kept dehydrating! 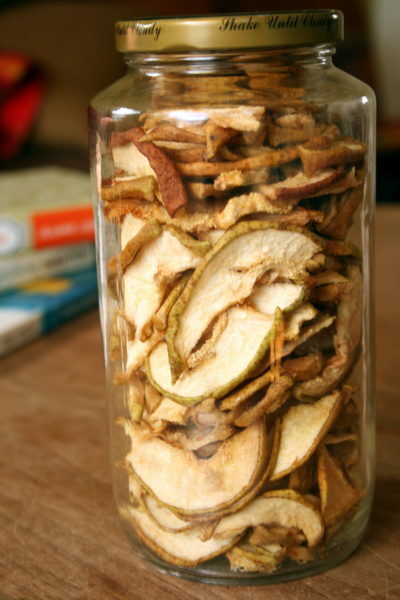 Dried fruit is easy to store and makes a pretty sight in the pantry. Now we have several jars full that will be a perfect addition to our homemade trail mix. We rely on this ever-changing power-packed mix for hiking and camping fuel throughout the year. Though, I don’t think they will last all year since I booted those raisins out of my bowl and have been pairing these dried pears with walnuts in my muesli. Such a satisfying way to start the day. Even thought it’s small, I love knowing that I’m skipping those raisins shipped from California and using the organic pears from our own yard. The last and most obvious method for using up pears in this house is pie. Pear galettes are good, but I wanted to make a a big, buttery crust. The custardy nature of pears lends themselves to, well, custard. 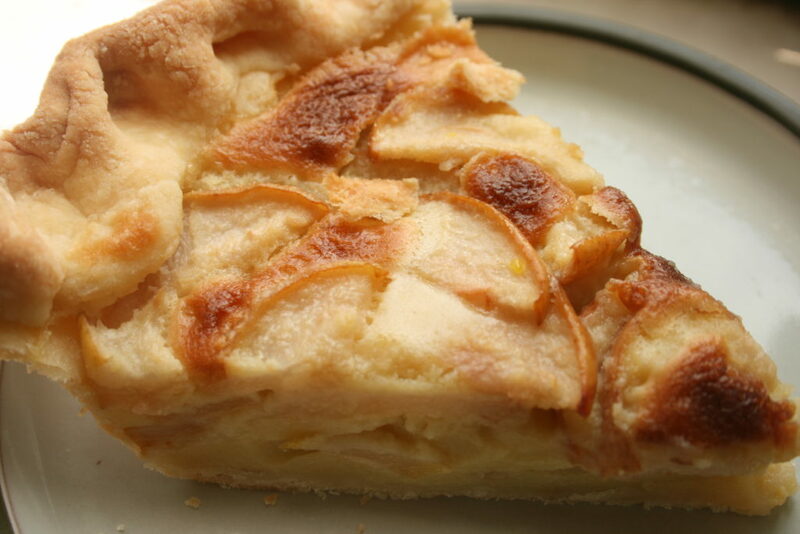 Apparently this type of pie already exists and won an award in the Moraga Pear Festival. My version just cuts the sugar way down to let that pear flavor shine. 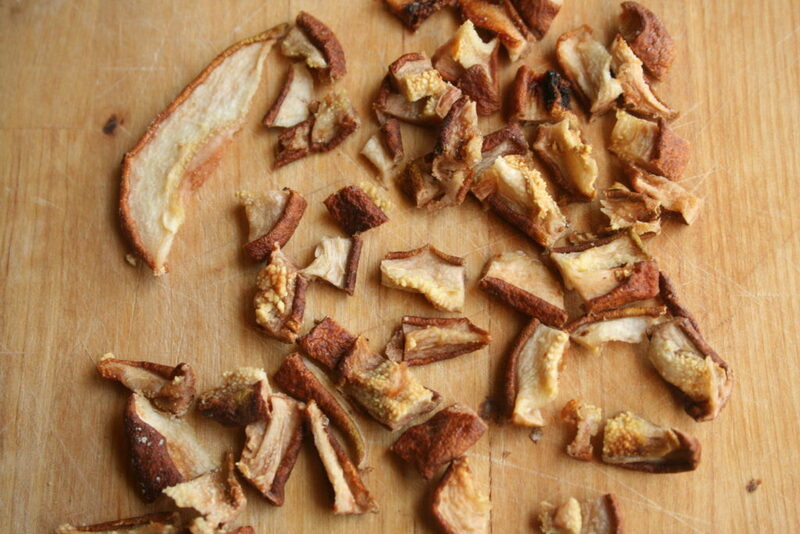 Pie crust – one or two, depending if you want a top crust. 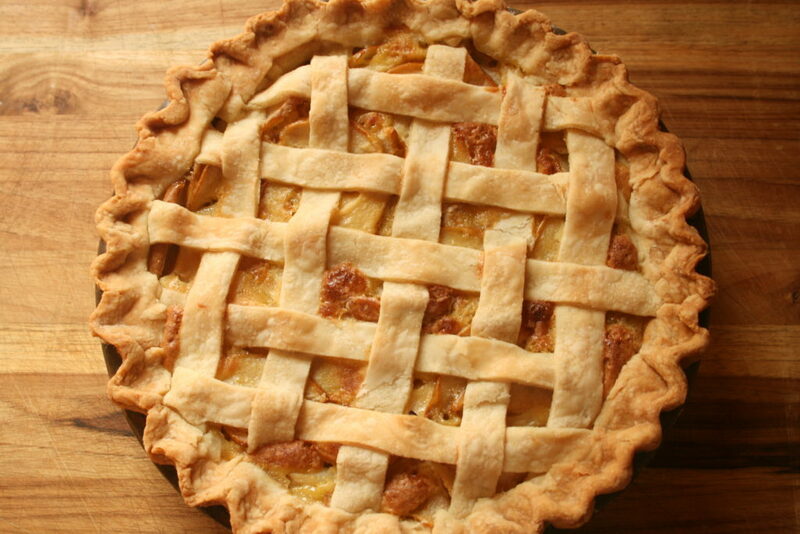 I recommend no top crust, or a light lattice, not a full top. Whip all of the custard ingredients together in a blender. Slice pears thinly. Peeling is up to preference (I don’t peel ours). Place the crust in the pie pan and spread out half of your pears in the crust. Pour half of your custard over the pears. Place the rest of the pears on top and top and pour over the remaining custard. 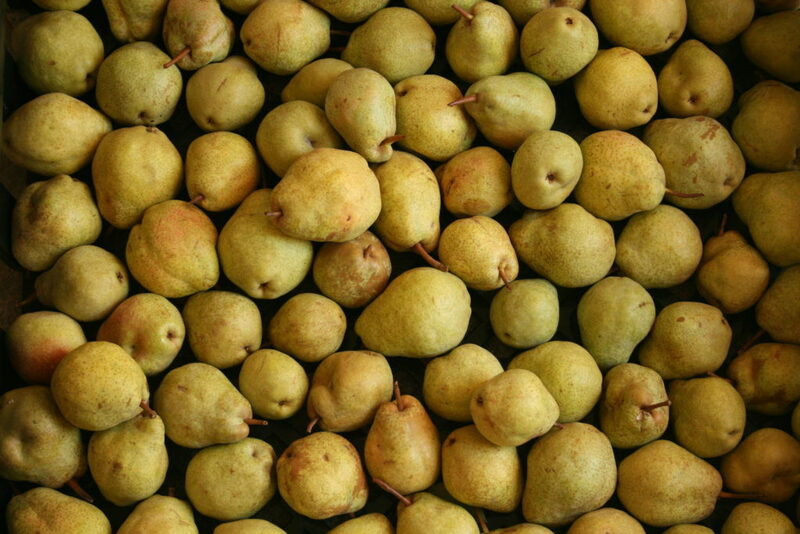 What’s your favorite way to eat pears?